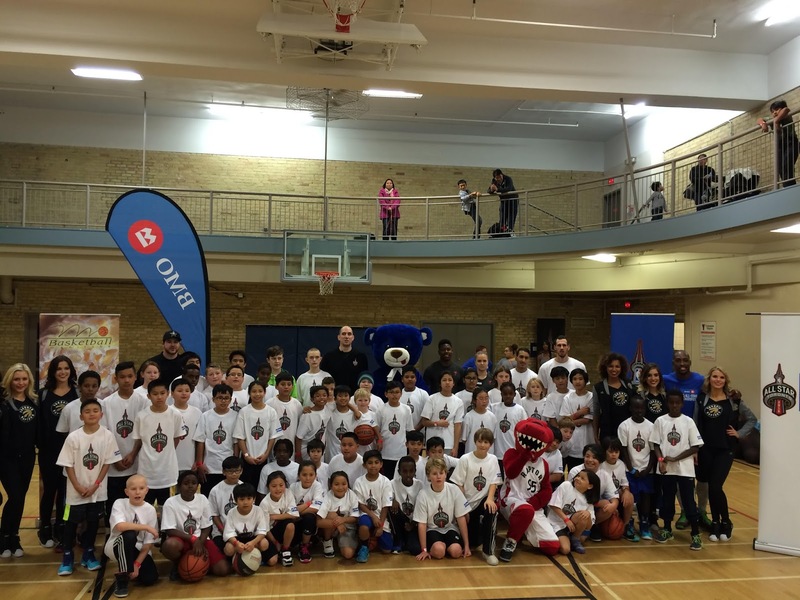 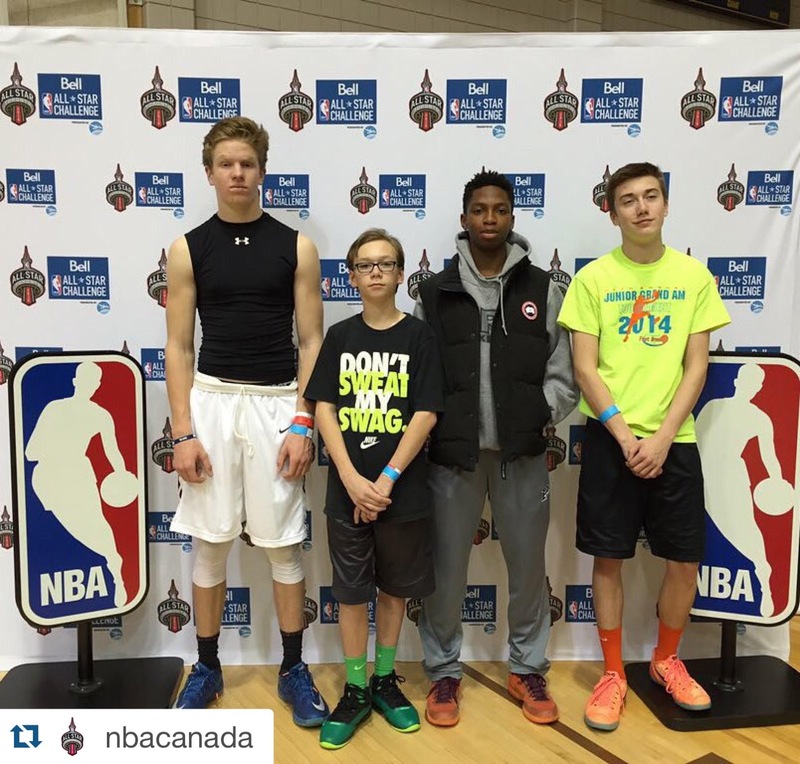 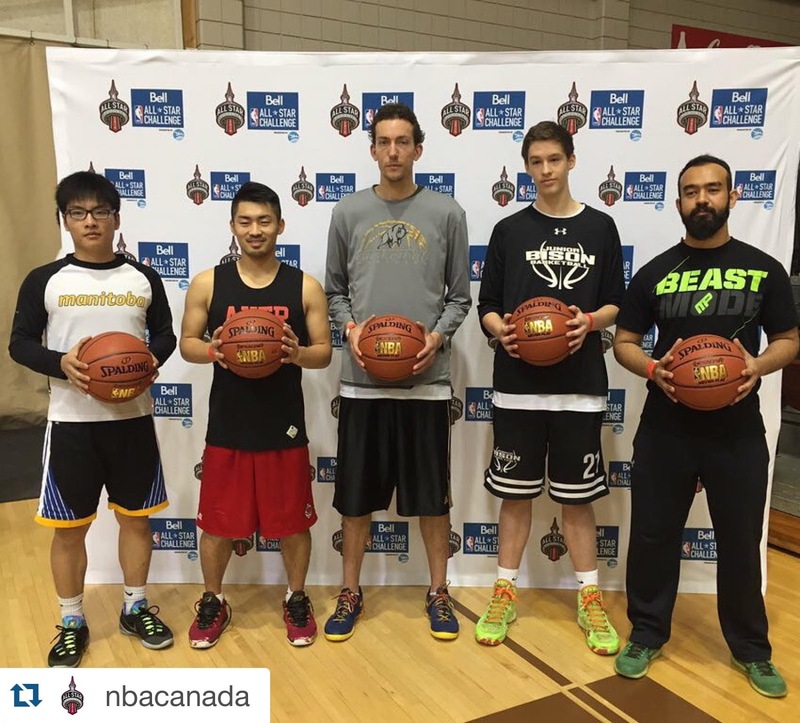 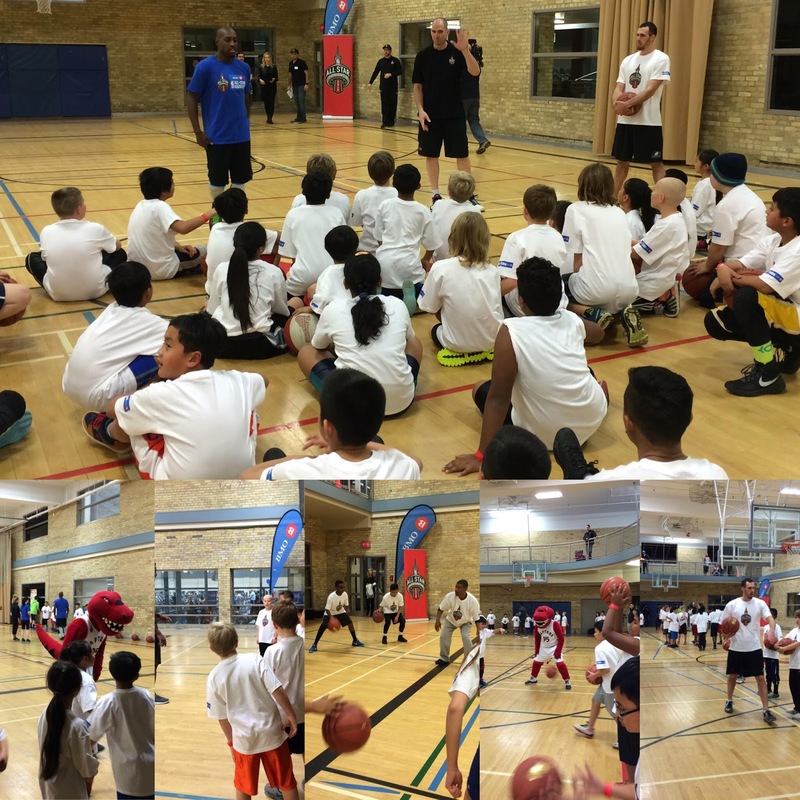 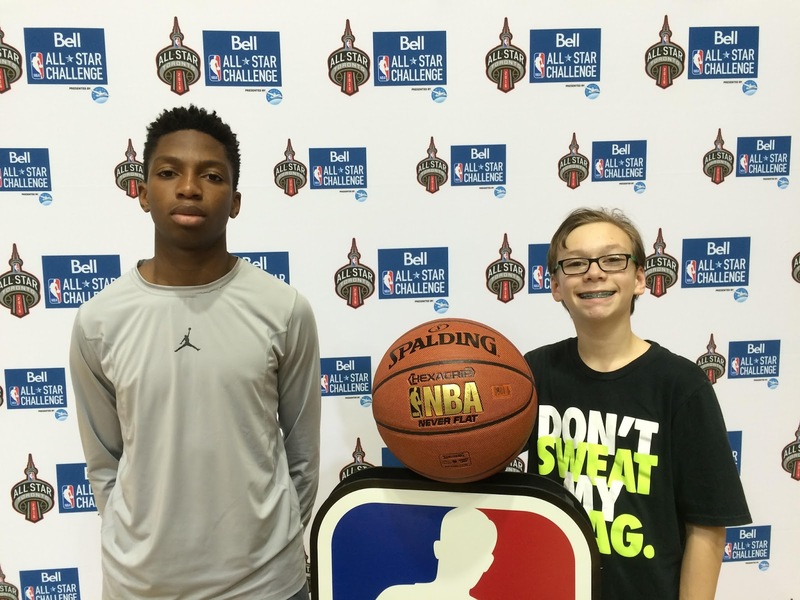 Basketball Manitoba would like to thank all the participants who joined the NBA as part of its All-Star Tour of events this past weekend in Winnipeg! 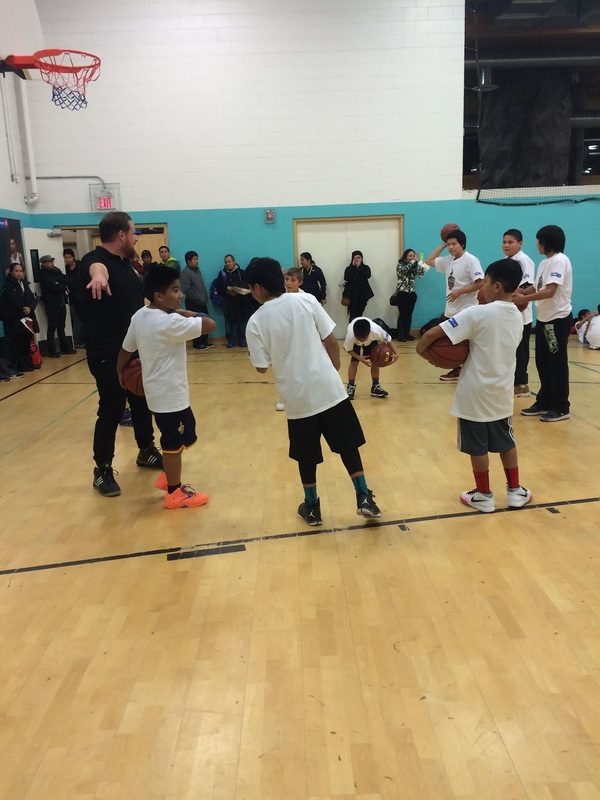 The whirlwind tour began Thursday night were a Jr NBA players clinic took place at the North End YMCA involving 60 players ages 8-13. 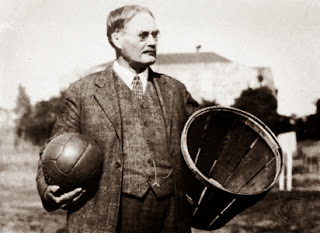 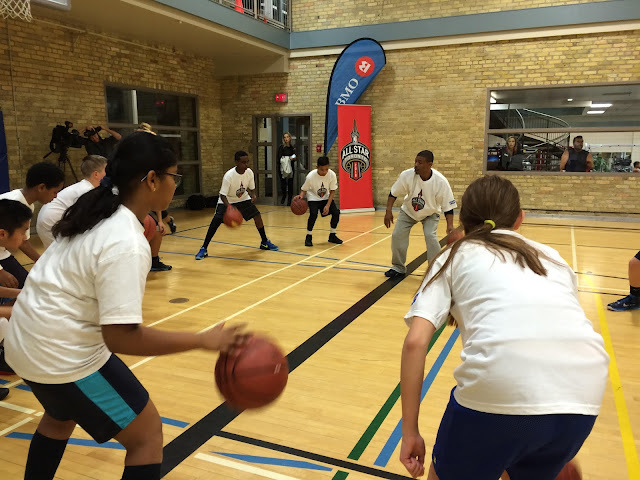 The players came from the local YMCA and members of the WAAY basketball league. 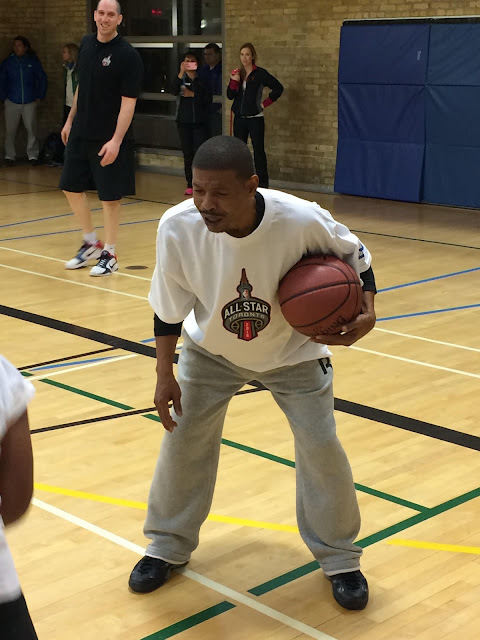 Joining the events on Friday was NBA Legend Muggsy Bogues who appeared on a number of morning news shows inviting local basketball fans to join him later that night and Saturday at the Downtown YMCA and University of Manitoba. 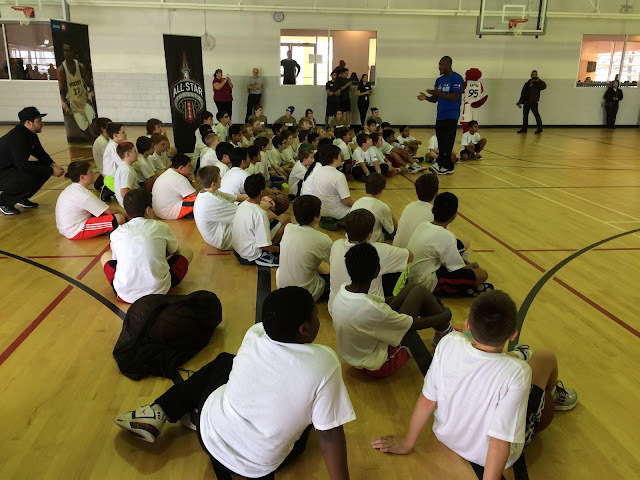 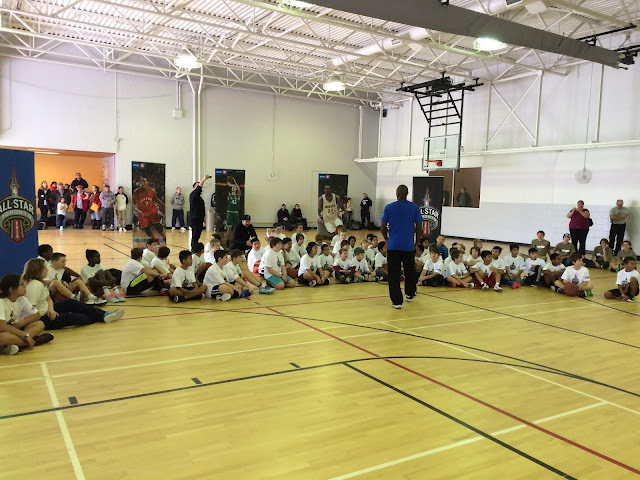 The Friday stop at the flagship Downtown YMCA saw two more Jr NBA player clinics involving over 75 local area YMCA members and from the Spence Neighborhood Association and a number of other hands on interactive basketball stops throughout the facility. 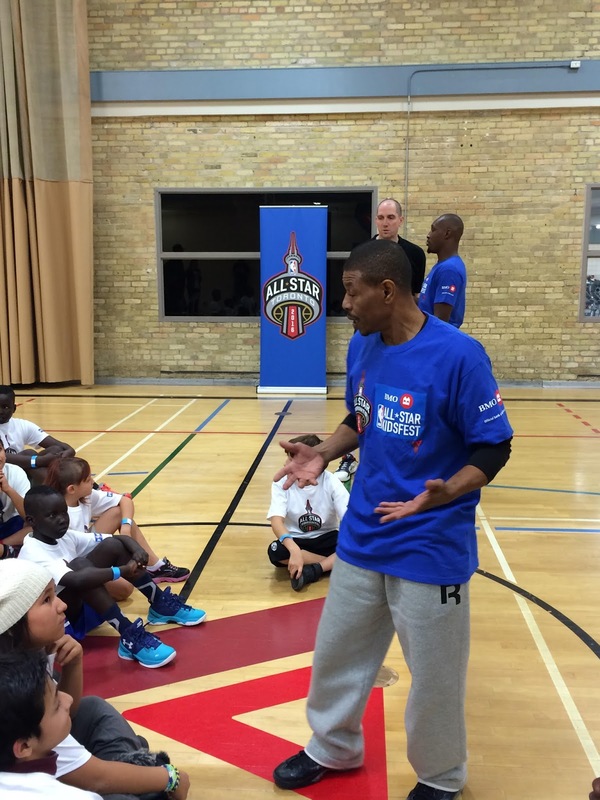 Muggsy joined the clinics giving attendees some ball handling and dribbling tips. 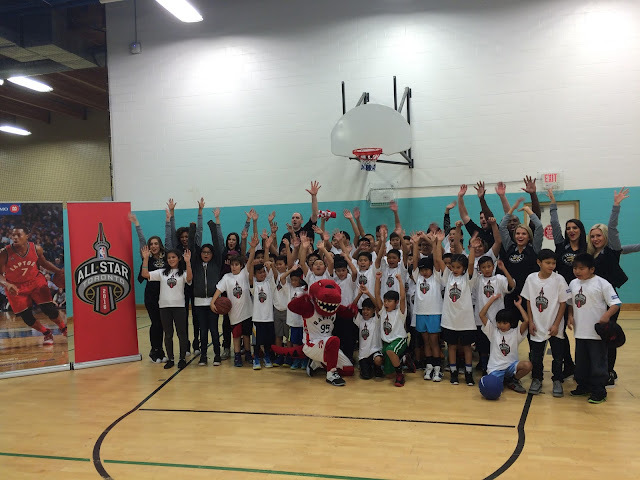 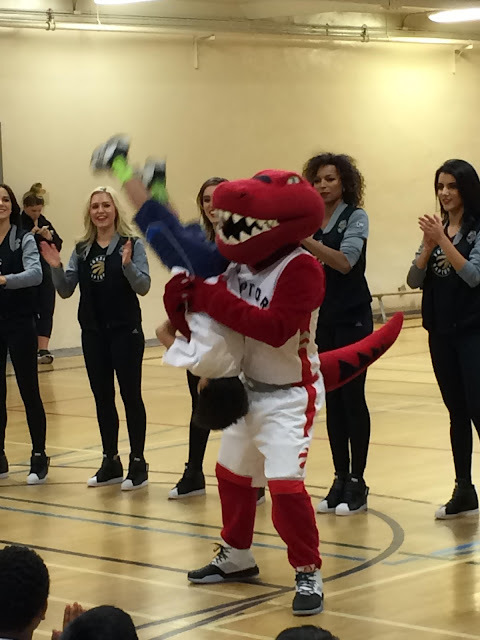 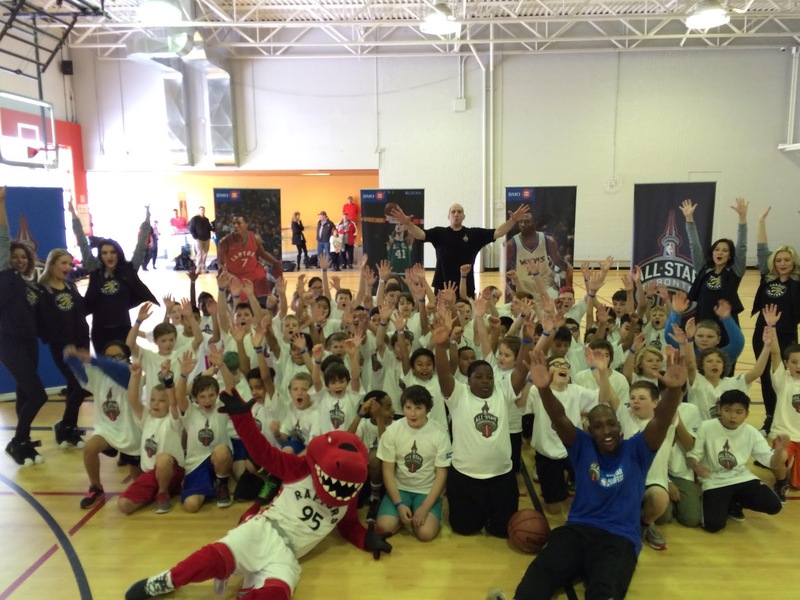 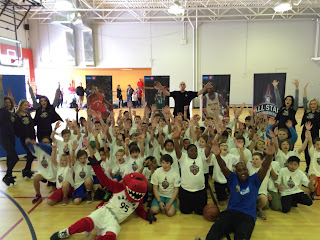 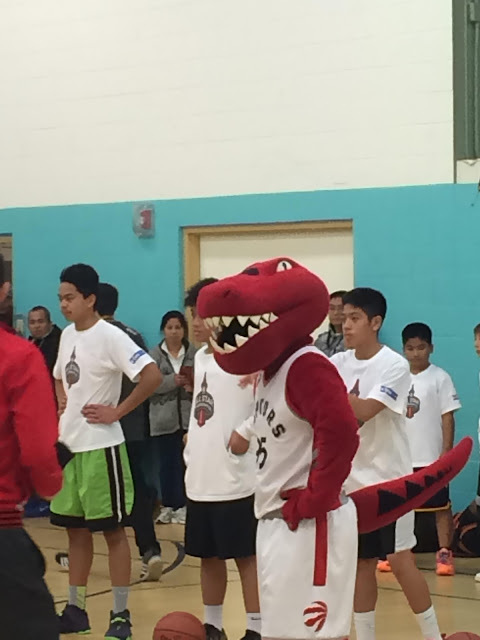 The clinics also involved professional dunker Michael 'Air Dogg' Stewart, the Toronto Raptor mascot and members of the Toronto Raptors Dance Pak. 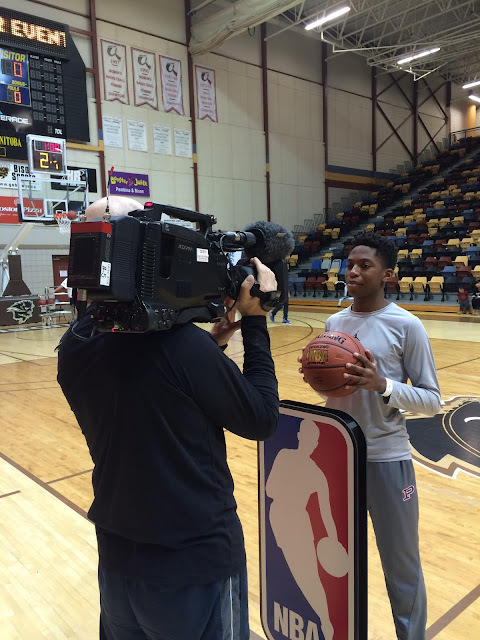 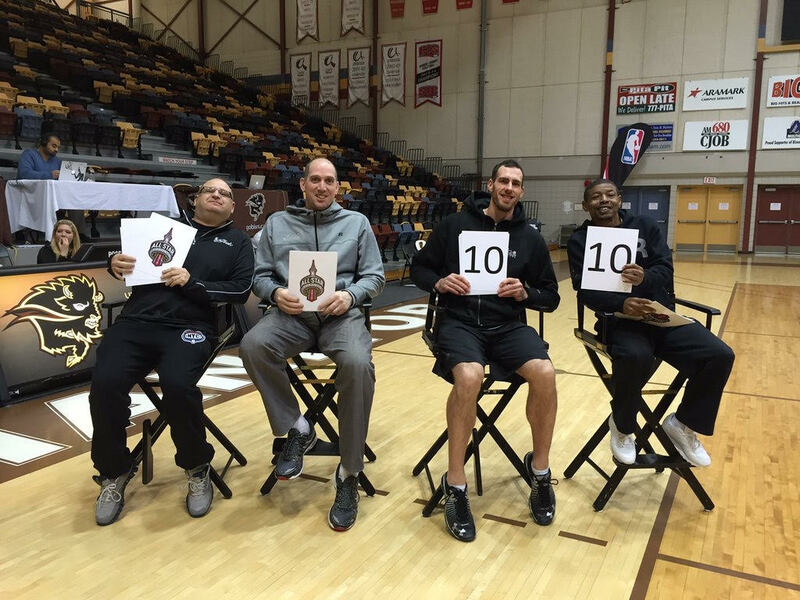 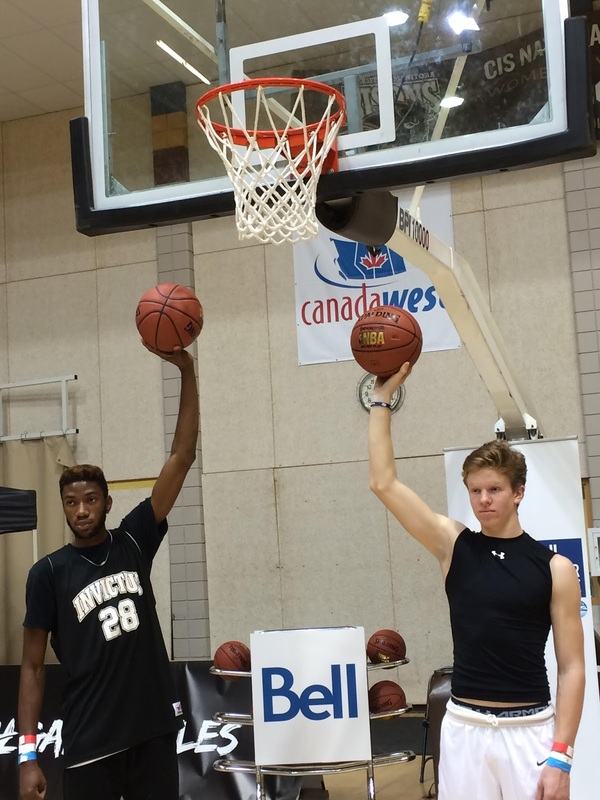 Saturday say the start of the Bell All-Star Challenge where anyone aged 14 and up could come down to the Investors Group Athletic Centre to try their hand at the Skills Challenge, 3-Point Shootout and Dunk Championships. The courses were set up identical to how the NBA All-Stars will compete in at the All-Star Game this February in Toronto. Coming away as the top finishers after the qualification, semi-final and final rounds were Ryan Johnson - Skills Challenge winner, Dhruv Barman - 3 Point Shoot Out winner and Isaac Onyeacholem - Slam Dunk winner (all pictured in the lower image left to right with the Toronto Raptors Dance Pak respectively. 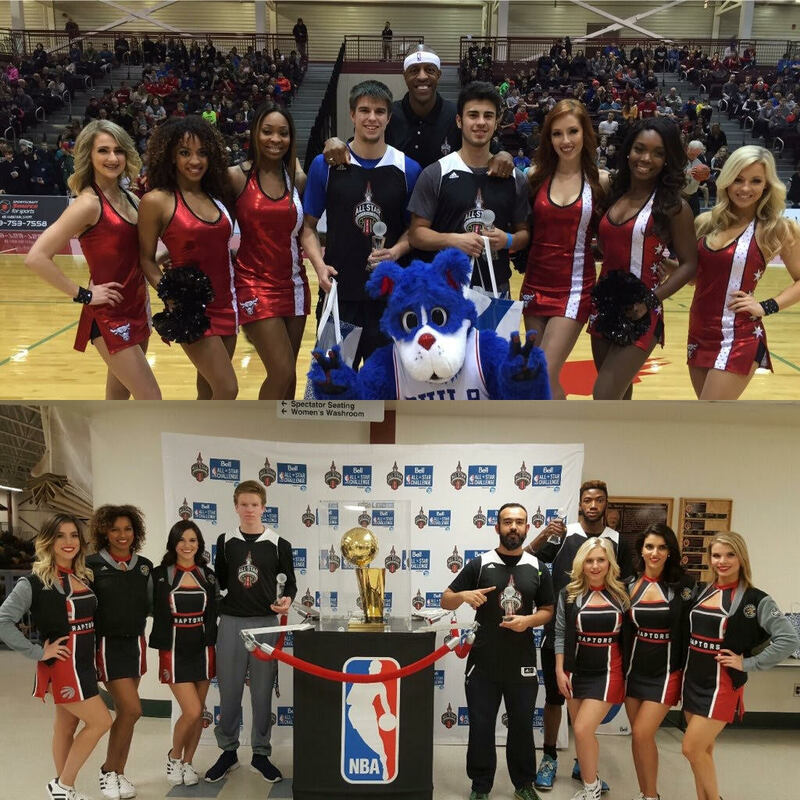 Top image shows the winners from St. John's, NL). 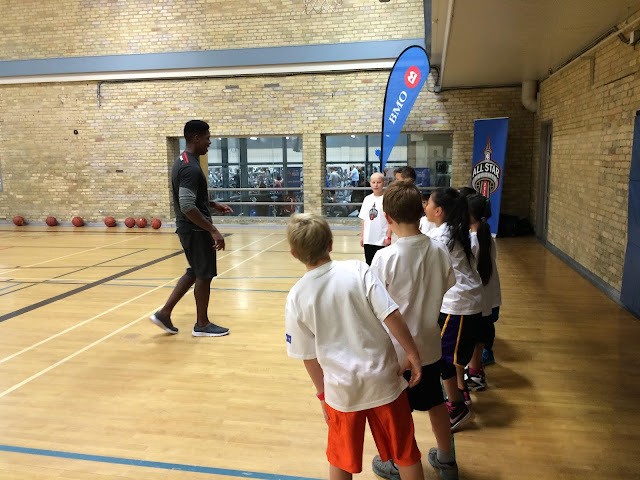 Wrapping up the weekend was a final players Jr NBA clinic at the West YMCA to another group of 60+ area children including those from the local YMCA and members of the WMBA's Kirkfield Westwood Community Centre. 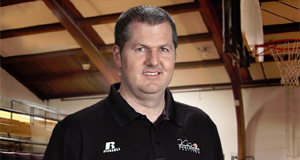 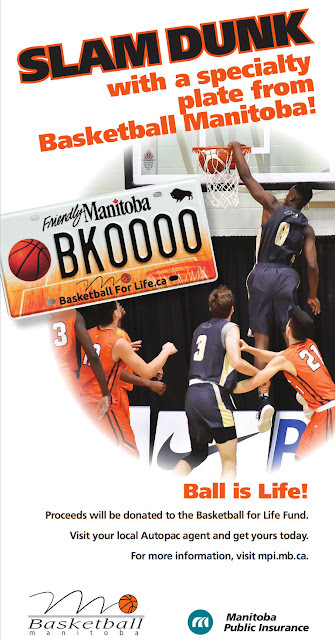 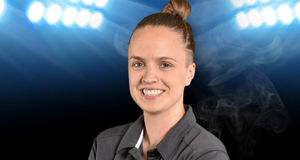 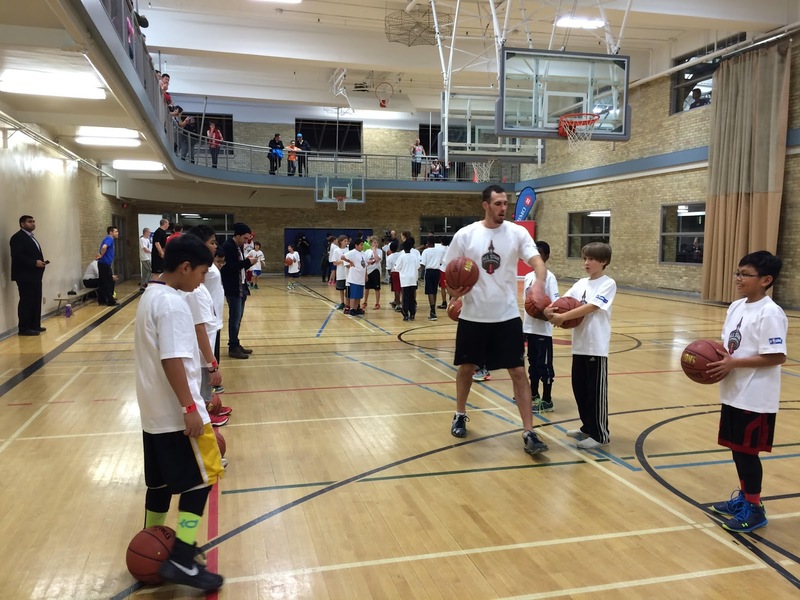 All camps were led by Basketball Manitoba's Dan Becker with on-court support from Ian Dickey, Suraj Kanda, Jillian Kehler, Adam Wedlake and 'Air Dogg'. 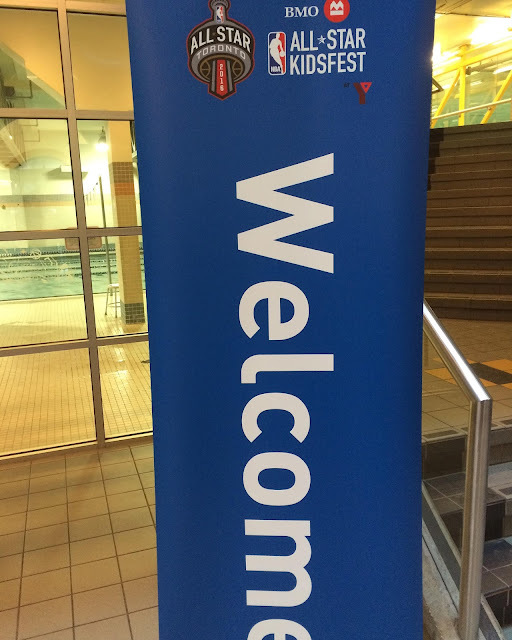 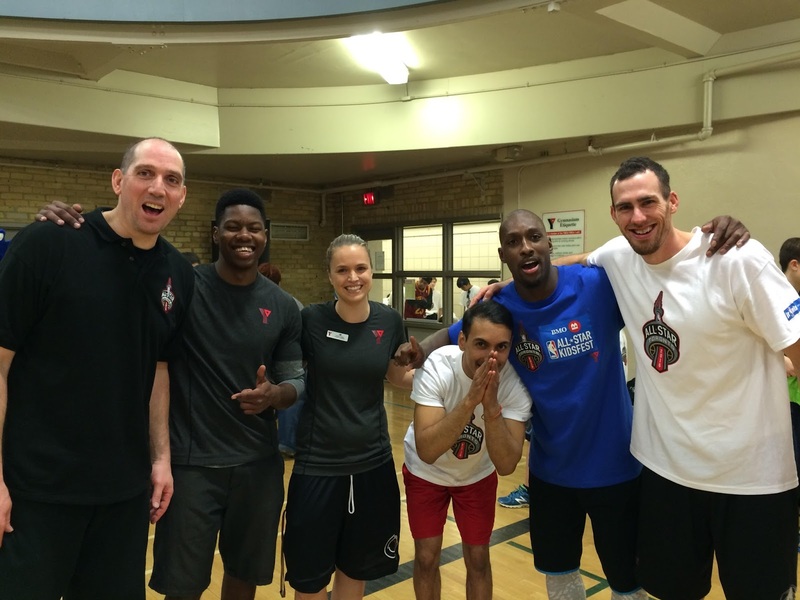 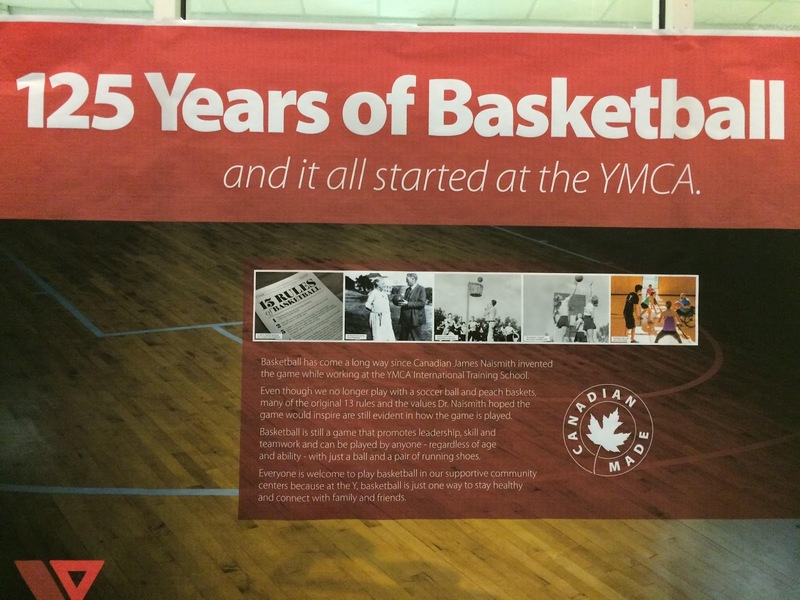 YMCA Winnipeg's Mike Whalen and his staff of supporters in making this all happen! 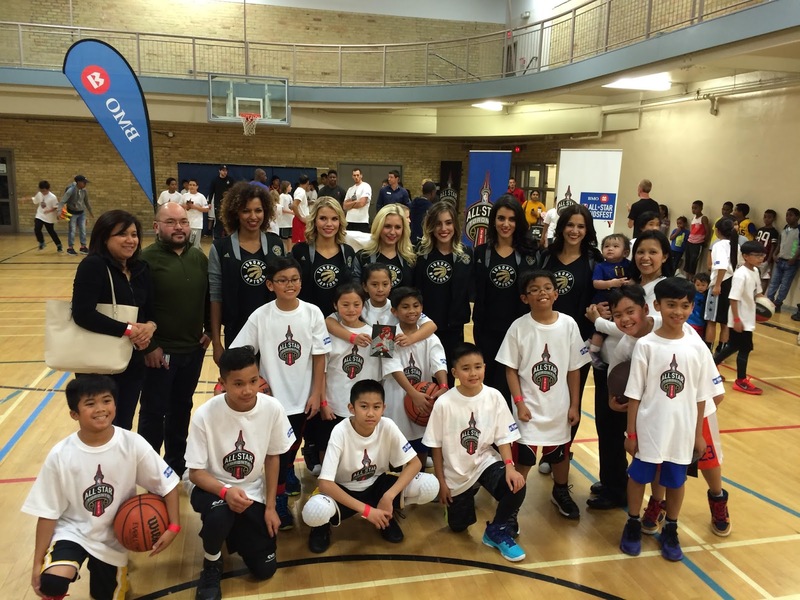 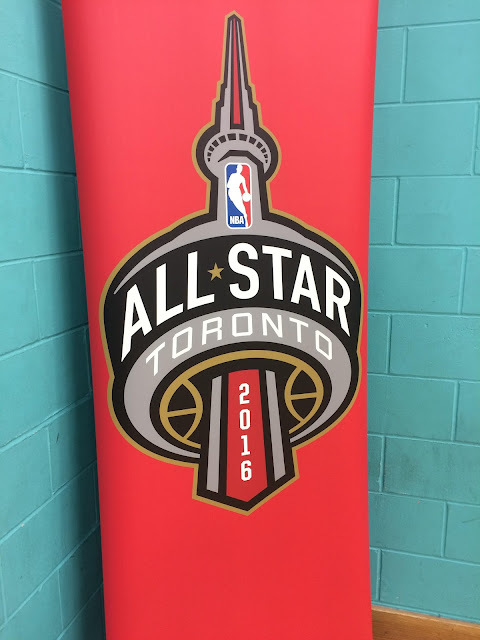 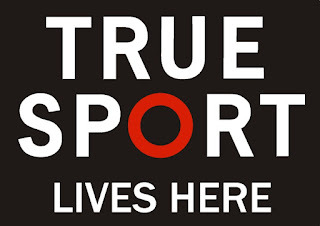 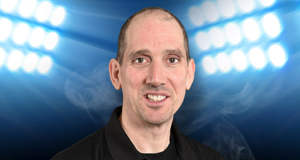 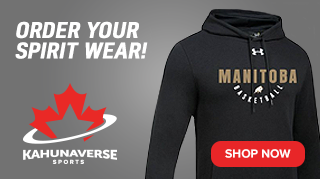 The tour continues to 13 other cities across Canada bringing the NBA experience to all provinces as a lead up to the NBA All-Star Game in Toronto this February.